[ARCHIVED THREAD] - Anyone into catfishin'? Caught this beauty last weekend while trolling for walleyes on Lake Labelle in Oconomowoc. I got one abot 10 pounds smaller 2 years ago on a bluegill. Nice Cat!!! Man thats about twice the weight of the biggest one I've ever caught. Nice color to it too. Very nice cat. A couple of years ago some kids fising the Fox River from a peddle boat in Eureka cought one just like that, only it was over 80 lbs. I fish up there all the time, but all I manage to get is smaller flats, or nice channel cats. Now I may just have to go cat fishing. Oh yeah, did I mention? Nice fish. WOW, that's a nice catch!! That had to be exciting. 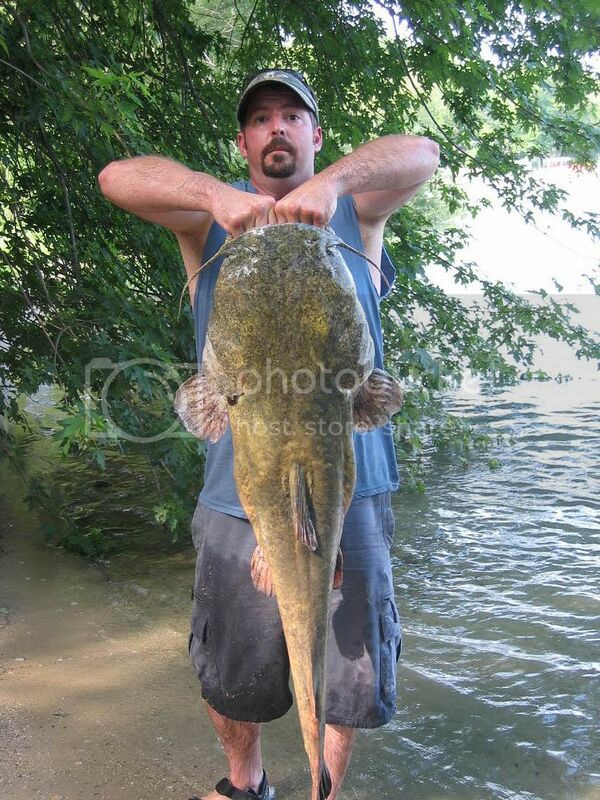 I caught a flathead in May of 2004, while fishing for walleyes in the WI River. It went about forty inches, if I recall correctly. Don't remember what the weight was on my Rapala scale though. I released it, because what else was I going to do with it? Lucky I had a musky net in the boat, as that made it easy to hold it at boatside while we measured it. Sent my pic in to John Gillespie's Wisconsin's Waters and Woods tv show www.thenextbite.com/site/featured_article.cfm?owner=AF230C7C-0AC9-4366-86729292E926800B, and got my pic on his show. You should send a picture of yours in. You can win, I believe, a $25 gift certificate from Fleet Farm, if your photo is picked to be featured on his show, which is a new show each week, that is usually filmed earlier that week. You have to pick up an entry blank at a Fleet Farm store, fill it out, and send it in, and cross your fingers.